I don’t envy bands who reunite and record new material, especially if they’re not a band that had a huge following in the first place. North Carolina’s Polvo crafted a sharp indie legacy on two big name indie-labels (Merge and then Touch and Go) across the early-to-late 90s, even hitting a creative high-water mark with 1997’s Shapes. Then they were gone in an amicable split. But 2008 saw the band reuniting to play All Tomorrow’s Parties and 2009 brought their return to home-state label, Merge, with their first album in 12 years, In Prism. With a band that carved out a unique presence in the often challenging (for many reasons) field of noisy math-rock, it’s hard to know what to expect after a decade plus hiatus, however the results are not only solid, but one of the band’s best efforts to date. 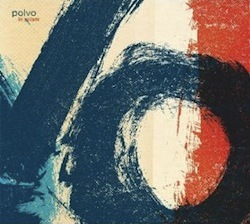 To describe a band as ‘math-rock’ immediately turns off a lot of listeners, but Polvo transcends the genre tag with genuine hooks and surprising melody. One of the album’s longest tracks, the 8+ minute “Lucia,” is a perfect example. The song doesn’t feel nearly its length, building as it does on the repetition beneath the heavy riffs of a looping melody line that doesn’t kick in until well past two minutes in, but immediately lifts the song (church bells and all) into a different level. It’s the type of song that is so head-noddingly catchy when it hits its stride that it’s impossible not to have floating in your head. The album has its share of shorter hitters as well. Lead single “Beggar’s Bowl,” clocking in at 5:02 (the album’s second shortest song), has a punctuating structure that leaves open space for the listener to revel in what’s going on in the louder sections. The band doesn’t overdo its heaviness, and it’s to their credit as the songs are allowed to wander and not overwhelm. “Right the Relation” opens the album with a swirling surge of noise that bounces around a shifting meter and starts the record off with a forthright purpose – a statement of return. I love this record. Couldn’t agree more. Never was a huge fan before but this really grabs me— Perhaps it’s time to revisit the back catalog…. I want to submit Beggar’s Bowl to classic rock/big FM radio. Maybe they move a few units as a result and can retire to a chateau in the Blue Ridge mts. The song is so flippin rockin and has that sweet interlude.